Cellulitis is a very common but a serious bacterial infection in which the skin appears swollen and red and is very painful as well as warm to touch. It affects the skin on the lower legs but it can occur on the face, arms as well as on the other areas. This infection occurs when a crack or break in the skin allows the bacteria to enter. If this infection is not treated timely, then the infection can spread to the lymph nodes as well as in the bloodstream and becomes life threatening rapidly. This infection is usually not contagious i.e. does not spread from person to another person. WHAT ARE THE SYMPTOMS OF CELLULITIS INFECTION? 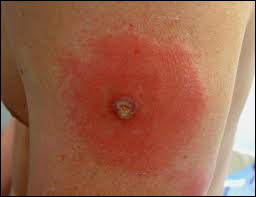 WHAT ARE THE CAUSES OF CELLULITIS INFECTION? Cellulitis infection occurs when the bacteria such as Streptococcus or Staphylococcus enter through the crack or break in the skin. This infection can occur anywhere on the body but the most common location is the lower leg. Bacteria usually enter at the disrupted areas of the skin such as where there is a recent surgery, cuts, wounds, puncture, wounds, athlete's foot, flaky skin, ulcer, swollen skin, dry, flaky skin, dermatitis etc. Cellulitis infection can be diagnosed by looking at the skin. In some cases, doctor may suggest blood tests or some other tests to help to rule out the other conditions. Modern medicine prescribes oral antibiotics to treat the cellulitis infection for 10-14 days. If the signs and symptoms do not respond to oral antibiotics or the patient has high fever, then the patient has to hospitalised and receive antibiotics through the veins. However, the inadvertent use of antibiotics in the past few decades have resulted in lower efficacy of the antibiotics. Hence, antibiotics are not effective in destroying the organisms and clearing the infection completely. Hence, patients are advised to use natural remedies which help in eliminating the bacteria as well as hasten the recovery without causing side effects. According to Ayurveda, cellulitis infection occurs due to the vitiation of all the three doshas, with Pitta dosha being the dominant one. The Ayurvedic treatment involves the use of herbs which have the ability to destroy the bacteria and also to protect the tissues against further damage. 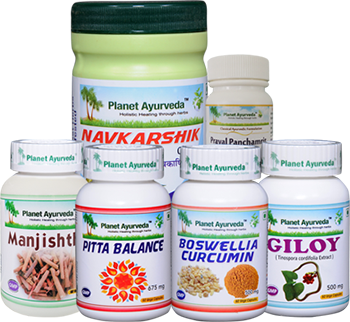 The natural remedies offered by Planet Ayurveda are anti-bacterial, anti-inflammatory, analgesic and anti-inflammatory in nature. Pitta Balance product of Planet Ayurveda is a unique combination of cooling and natural calcium compounds to restore the Pitta imbalance quickly. The root cause of infections is the vitiation of Pitta dosha in the body, hence these capsules are very beneficial for the patients of Cellulitis infection as these help in balancing of Pitta dosha in the body. Dose: 1 capsule twice daily. Dose: 1 tablet twice daily. Manjishtha Capsules by Planet Ayurveda contains the standardised extract of the herb Rubia cordifolia. This herb is best known for blood purification as well as to treat all kinds of skin disorders. Manjishtha is a cooling herb that pacifies Pitta dosha. Dose: 2 capsules twice daily. Boswellia-Curcumin Capsules offered by Planet Ayurveda contain the standardised extracts of the herbs Boswellia serrata and Curcuma longa. Both these herbs possess anti-inflammatory effect. Thus, these capsules are very effective in edema associated with cellulitis infection. Giloy Capsules of Planet Ayurveda contain the standardised extract of the herb Tinospora cordifolia. This herb is an excellent immune-modulator. The healthy immune system is necessary in order to achieve resistance to various diseases. The immune system of the person is impaired when the person suffers from various infections. Skin infections are also a common cause of weak immune system as weak immunity causes the foreign bodies to cause serious skin infection. 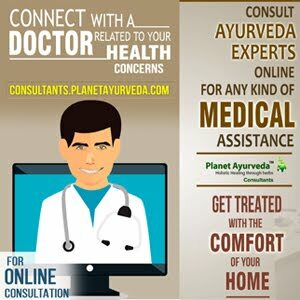 Navkarshik Churna of Planet Ayurveda is a unique herbal formulation of various herbs which are anti-inflammatory, antiseptic and anti-bacterial in nature. This churna not only helps in relieving pain but also helps in the healing of wounds and prevents any sort of infection in the body. This churna also acts as immunomodulator and helps in improving the immunity of the patient. Dose: 1 tablespoon twice daily or boil 1 teaspoonful powder in 400 ml water, keep it boiling until it remains 50 ml. Strain it and drink the water. Leave the residue. Do it twice daily. Make fresh every time.